While reviewing the Galaxy A7 (2018), we noted how Samsung is using the A-series smartphones as a test-bed for new features. The A7 was the first to offer a triple-camera setup and now, a series of leaks and rumours suggest the upcoming Samsung Galaxy S10 series will tout triple cameras as well. Samsung also followed up the Galaxy A7 with the Galaxy A9 that became the world’s first smartphone with a quad-camera setup on the back. Now, it is an ongoing debate as to whether cramming more cameras in the phone counts as significant innovation, but Samsung’s marketing machinery would want to convince you it does. We used the Samsung Galaxy A9 for a long time, testing the performance and using the camera to take all kinds of photos. The versatality the Galaxy A9 offers in smartphone photography was impressive, but was the quality as good as you would expect from a high-end Galaxy phone? Let’s find out. It’s not just the cameras that are new in the Galaxy A9. Samsung also used a gradient colour finish for the first time on a Galaxy phone, and it certainly looks refreshingly good. Design that millenials will like was what Samsung was aiming for, and it hit the mark with the new colour treatment in the Galaxy A9. It’s easy to recognise the Galaxy A9 particularly for the rather large camera module, but also for the colour finish. The A9 is offered in a vibrant Bubblegum Pink that has shades of pink and red. Then there’s the Lemon Blue which we received for review, and it looks refreshingly good. Samsung has also kept a no-frills black variant for those who don’t prefer such fancy colours. Now while the phone does look good when you take it out of the box, after an hour the rear panel was smudged with fingerprints. You do get a case in the retail box whichf comes useful in keeping the phone clean. The fact that there’s a glass panel on the back automatically reduces the durability as it’s bound to break if it falls from your hand. The Galaxy A9 is not a phone you can use one-handed comfortably. It has a giant footprint that’s wide and stretches to over 6.3-inches, and not quite ergonomic to use. I used the phone as a daily driver for a few days and had particular difficulty while commuting when I usually have only one hand free. Despite its giant stature, the fingerprint sensor on the back is easy to reach. It’s placed conveniently in the centre of the rear panel and was quite responsive too. While the form factor is certainly big, the screen itself takes up most of the real estate up front. 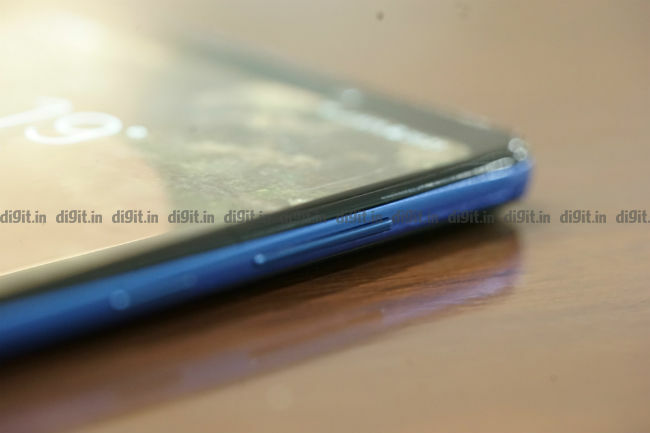 There’s big, but non-intrusive bezels on the top and the bottom and really thin ones on the sides. 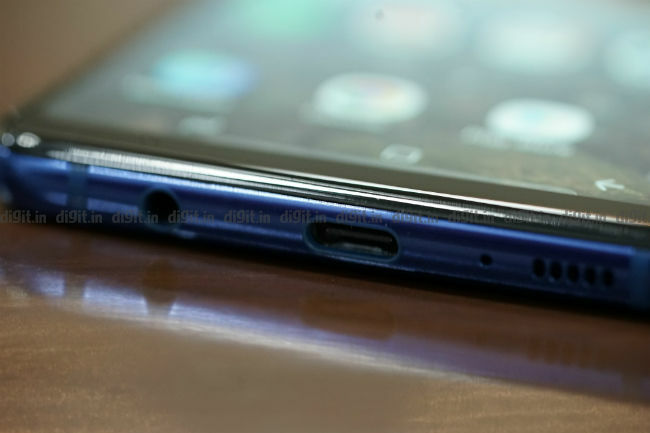 What’s more impressive is the fact that Samsung has stubbornly held out against using the notch and the Galaxy A9 has a seamless, uninterrupted panel with components like proximity sensor, earpiece and the front camera flushed to the upper bezel. The gradient colour design has been overdone by Chinese phonemakers like Honor and Oppo, but Samsung’s first such offering is a commendable effort. Perhaps the upcoming Galaxy S10 will have something similar? The Samsung Galaxy A9 has a rather big display that sticks to the older 18:9 aspect ratio. Samsung packed 1080 x 2220 pixels with 393 pixels per inch. The pixel density is lower than most phones in that price range, and that occasionally shows when you look closer at the stock wallpaper. You can see banding where one colour blends into another. However, watching videos on YouTube and Netflix is a good enough experience. The Super AMOLED panel boosts the contrast levels making videos appear quite vibrant and rich. We registered peak brightness of 671 lux, similar to other high-end phones we tested last year including the OnePlus 6T, while the minimum brightness fell down to 3 lux, which is dim enough to read comfortably in the dark. Samsung is known for making good displays and the Galaxy A9 is another example of that. It’s a well optimised panel and while it lacks the high pixel density that makes panels like the OnePlus 6T appear much sharper, it more than makes up for it in terms of colour reproduction. It’s Widevine L1 certified, so you can stream videos from Netflix and Amazon Prime Video in FullHD resolution. The big display is especially good for watching content and playing games. In the Galaxy A9, Samsung’s main focus was on the cameras. As a result, even though it faces off against high-end flagships like the OnePlus 6T and the LG G7 ThinQ, the phone relies on a mid-range processor. The Snapdragon 660 has proven to be quite capable in handling daily tasks, but it’s just not as seamlessly smooth as devices powered by the Snapdragon 845 which are its primary competition. The benchmark results reflect that fact. On AnTuTu, the Galaxy A9 scored 138800, almost half the score of the Snapdragon 845-powered Asus Zenfone 5z 268993 and the Poco F1’s 265754. As compared to the Mi A2 which is also powered by the Snapdragon, the Galaxy A9 did score higher. 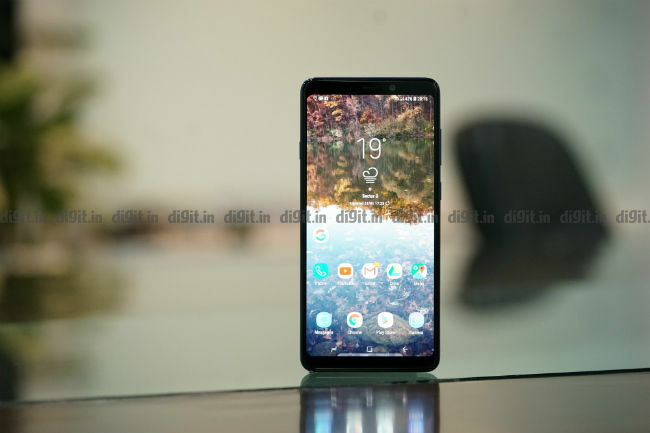 On Geekbench Single and Multi core tests, the Galaxy A9 scored 1612 and 5694 respectively, expectedly lower than the Asus Zenfone 5z. However, the scores were higher than other Snapdragon 660-powered devices. 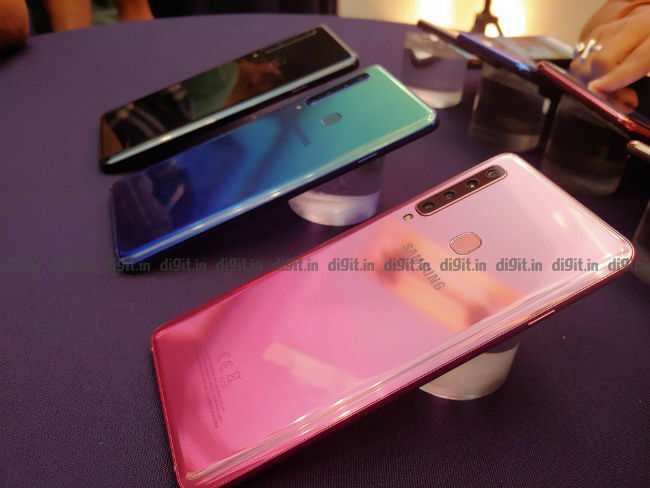 Clearly, the A9 is no match for the high-end smartphones like the Asus Zenfone 5z and the Poco F1, but that doesn’t mean the phone isn’t good for heavy usage. Throughout our usage, the Galaxy A9 didn’t slow down or take a lot of time to launch apps and the likes. The Samsung Experience UI is well optimised to launch apps with relative speed, but there are some bugs. The camera app especially had a few bugs that Samsung might iron out later in an update. Notably, switching between the lenses sometimes doesn’t work and the camera app freezes occasionally. There are online reports of screen freezing and unexpected shutdowns, but we didn’t face any such thing in the course of the review. Gaming on the Galaxy A9 is good enough, particularly for the vibrant screen, but the phone also has some heating issues. While Playing PubG Mobile, we registered temperatures around 45 degrees indicating there is significant heating inside the chassis which won’t be good in the long run. Other games like Subway Surfer and Dead Trigger 2 also performed well without any significant lags, but even there’s some heating on the back. Four cameras adorn the back of the Galaxy A9. It is the first smartphone to sport such a setup. The setup allows one to shoot wide-angle photos, zoomed in (2X optical) photos and portrait mode shots thanks to an additional depth sensor. The imaging stack has a 24-megapixel primary sensor with f/1.7 aperture and PDAF, a 12mm wide-angle lens with 8-megapixel sensor and a third 10-megapixel sensor with 54mm f/2.4 telephoto lens. The fourth camera is a 5-megapixel depth sensor for portrait images. 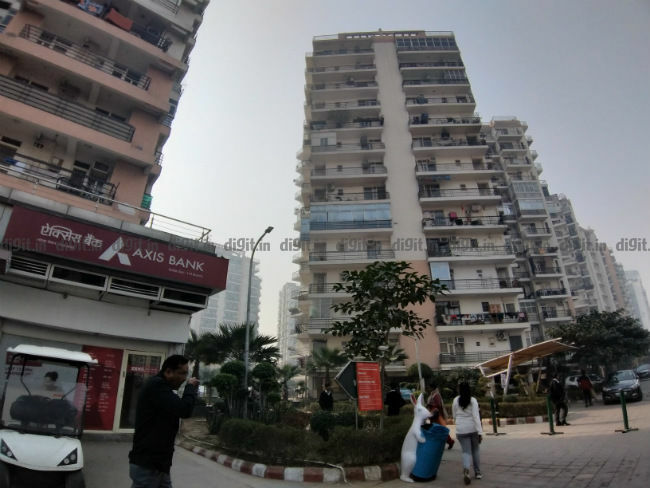 However, as we noted in a closer look at the Galaxy A9 camera, the wide-angle lens does not have autofocus and the focus is fixed at infinity. We also noted that the depth sensor in the imaging stack makes no real sense as the telephoto and wide-angle lens can be enough to provide the required depth information. Which leads us to believe, did Samsung put a four-camera setup on the back of the Galaxy A9 just for the heck of it? In the in-depth piece, we had noted the primary camera skips on any optical image stabilisation and as a result, low light photos aren’t so nice. Also, while shooting indoors, food shots showed some amounts of blurring. Samsung does apply its signature noise reduction algorithms in photos, giving them a warm tone. The primary sensor also has a tendency to blow highlights, and the shadows come out darker than usual. You need to be aware of this and adjust the frame accordingly. The ultra-wide angle camera offers a 12mm wide field of view, and does not let you selectively focus on an object in the frame. While shooting in the day, the brightly lit areas are more exposed as compared to the darker areas. You also can’t leverage the ultra-wide angle lens in the Pro mode where the option to switch lenses is not present. The ultra-wide angle lens also has high barrel distortion making straight lines appear curved. 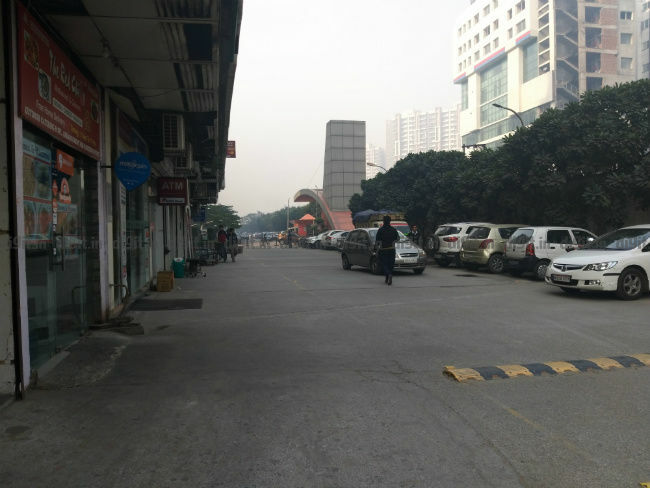 Other phones like the LG G7+ ThinQ and the Huawei Mate 20 Pro which ultra-wide lenses as well have much lesser distortion. It seems Samsung has more to do in making wide-angle photos appear natural, and considering this is their first attempt at one, there much more left to be done. While the wide-angle photography can be considered a hit or miss, the portrait mode on the Galaxy A9 is pretty good. While Samsung could have simply used the existing telephoto and wide-angle lens to gather depth information, the 5MP depth sensor does a good job in itself. The separation too was fairly consistent and the ability to tweak the level of bokeh is quite handy. The selfie camera on the Galaxy A9 isn’t the best out there though. 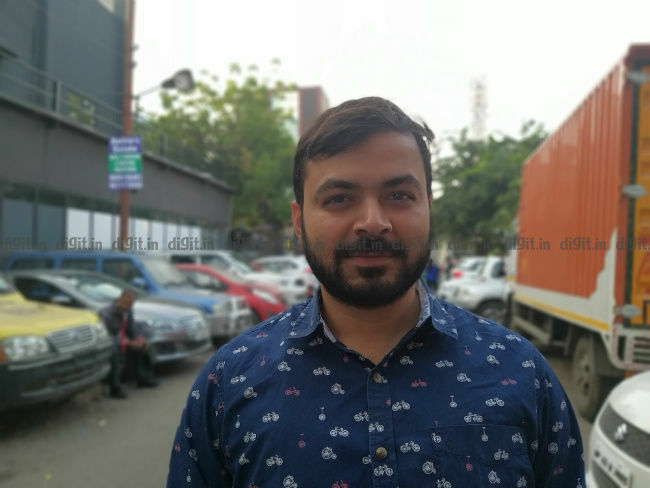 In this case, the OnePlus 6T and the Asus Zenfone 5z manages to click far better, more vibrant selfies than the 24MP sensor on the Galaxy A9. Overall, the biggest USP of the Galaxy A9 is also its biggest weakness. Samsung hyped up the camera to an extent that I was expecting something ground-breaking from the Korean giant. 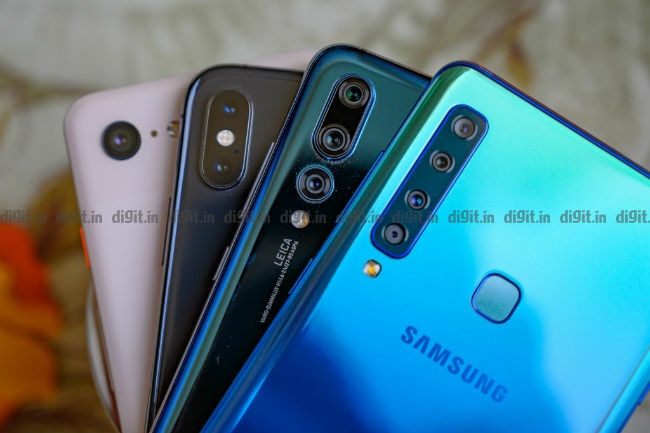 While Samsung is very much known to leave a lasting impression when it comes to their flagships, the Galaxy A9’s camera is simply playing the numbers game and trying to live on the hype of being the world’s first quad-camera phone. Check out all the image samples in high resolution with EXIF data. The Galaxy A9 packs a decent 3800mAh battery that the company claims keeps the phone going for over a day. That’s not the case as our extensive battery test revealed. The 3800mAh capacity is quite large for a mid-range smartphone, but the Galaxy A9 will give you around 6.5 hours of screen-on time, as revealed by the PCMark Work 2.0 battery test. 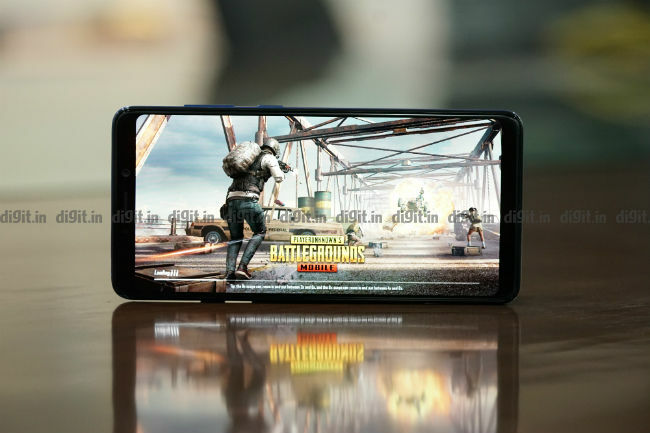 While gaming, the Galaxy A9’s battery dropped from 63 percent to 51 percent after half an hour of PubG Mobile and 30 minutes of Google Maps navigation drained the battery by 12 percent. The phone also doesn’t support fast charging and topping up the battery to its full capacity takes more than 2 hours.